Mix Tomato Salsa all together and let stand for 30 minutes, maybe be stored in fridge for several days. Carefully pick through the crab meat, removing any pieces of shell. Keep the lumps of crab meat as large as possible. Place the cream in a saucepan and bring to a boil. Reduce by approximately one half. Chill the cream well. Sauté the red and green bell peppers in a small amount of clarified butter until tender. Combine the crab meat, reduced cream, peppers, green onions and approximately 3 ounces (90 grams) of the bread crumbs along with the salt, pepper, Dijon mustard, Worcestershire sauce, Tabasco sauce and egg. Mix to combine all ingredients, trying to keep the lumps of crab meat intact. Using a mold, form the crab mixture into cakes of the desired size. Place the remaining bread crumbs in an appropriately sized hotel pan. Place the crab cakes, a few at a time, in the hotel pan and cover with the bread crumbs. To help them adhere, press the crumbs lightly into the cakes. Heat a sauté pan over moderate heat and add enough clarified butter to cover the bottom approximately 1/4 inch (1/2 centimeter) deep. Add the crab cakes to the pan and cook until done, turning once when the first side is nicely browned. Remove and drain on absorbent paper. 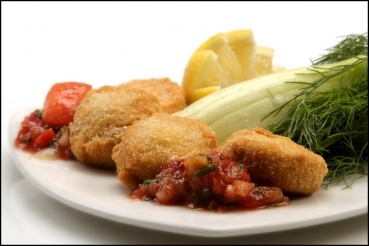 Serve the crab cakes with fresh tomato salsa.